Well where to start, I was born on the 20th of February in 1975 and at my birth there was something visibly wrong with me. My legs were large and my feet very large and deformed (for want of a better word to use).It wasn’t until a few weeks later that i was actually allowed home with my parents as the doctors did not know if i would live or die, but hey I’m still here at 39 having fun! On reaching school age I attended a special school being there we all had physical problems so we knew that we had limitations, but we accepted that. On reaching 14 i was enrolled part-time in a comprehensive school to do my GCSE‘s came away with 4 GCSE’s. · After school i started college to do an Art course and more GCSE’s. I made good friends and along with studying enjoyed some weekends away with plenty of booze and drunken nights. · After leaving college i went to study a degree in Graphic Design away from home. However I had mobility difficulties and didn’t find it easy so deferred my course and came home to have an operation to reduce the weight of my legs. · Soon after i wanted my independence and found my own home and lived it up by spending weekends drinking and dancing the night away! · At the same time i did courses in Sociology, Psychology and Criminology. · I then went on to do a degree in Psychology, a long 3 years, but enjoyable and I met some lovely people and one person, Amanda, who is now one of my best friends. After taking a quiet year of study and doing a course in Sign Language, i followed that with a desire to be a counsellor. 3 long years of the course lay ahead. · However, 2 years into it i suffered a Deep Vein Thrombosis (DVT) and was paralysed for 6 weeks. Once the feeling returned I had to learn to walk again, which i did and got back on the counselling course and caught up with the work. · During my counselling course i did lots of voluntary work in various fields, and found that it gave me a lot of confidence. · Living on my own and looking for some type of work i’ve spent lots of time on the internet and have met some lovely people. One person, who is now a best friend, is Sue she has been there for me when ive needed someone, especially after my long stay in hospital. · Then again, after another short course in mediation, i was admitted to hospital this time for 5 months. Developing blood infections, kidney and stomach problems, urine infections, severe anemia, and MRSA and foot drop. Again i had to learn to walk, it took a while but i’m at least now back to myself, walking is a little harder but it won’t stop me! · The beginning of the year (2006) i was still getting back on my feet, walking was slowly getting easier. 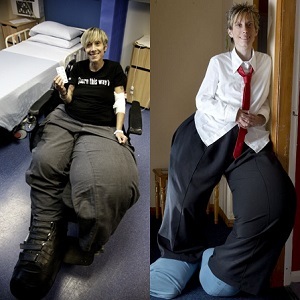 · At the same time i was in touch with Tracey Whitewood-Neal, founder of the Proteus Syndrome Foundation UK (PSF UK) who put me in touch with the top doctor in the world who knows as much as there is to know about PS. · Following a consultation with him in May i was finally told that i possibly do have Proteus Syndrome. It wasnt a definite diagnosis, but its the nearest i have ever to come to knowing. · After the help i received from the PSF i wanted to give something back and do some fundraising, so after a few weeks of organising the £ for PSF Day was born. So after this the media wheel started to turn and the rest as they say is history. So after all the media coverage I have had, 2010 brought a year of big change, after living with infection after infection for up to 12 years, my ulcer on my left foot developed blood poisoning. This meant that it had to be amputated or it would have killed me. I was very ill at the time and it took 6 months for me to be discharged from hospital and then I had to start all over again to gain my independence and get my life back on track. It is now 2012 and I am still on the road of recovery, but I have belief in myself that one day I will achieve what I need to have a full and independent life. So here we are in 2014 & I am still striving for independence and I will get there, I am due to get a new vehicle soon that will mean I can drive from my wheelchair. This will make a huge difference to my life and will mean that I can actually leave my home on my own for the first time in 4 and half years! I still need a new wheelchair that I can get in and out of without hurting myself, but that will hopefully be in the pipeline soon, so watch this space for pics of me whizzing around in my WAV (wheelchair Accessible Vehicle). Summary: Mandy’s answer to the five questions! Listen to the full conversation on the player above; also available on iTunes, Stitcher and Soundcloud. The people that cope when life kicks them down and just get back again and make life beautiful again, those people that have that inner strength, those are the types of people that I look up to. The moment in life that really sticks out for me was when my leg got amputated due to an infection. I remember that time and remember coming around from the anesthetic and it just made me realize that I’ve been given a second chance at life because I was absolutely convinced that I was going to die on the operating table just because I was so ill before the operation. I’ve been given that second chance and this gave me hope because I knew that I could start my life again. Obviously the road to recovery definitely wasn’t easy. There was physical pain, lengthy stay in hospital and there’s also the psychological and emotional pain. The grief you feel when you lose a part of the body, I mean for myself, even though that part didn’t work very well and it did make life probably extremely difficult before the amputation, it was still a loss. Knowing that I’ve been given that second chance gave me hope that life can be good again. It’s what I call a light at the end of the tunnel. At times that light certainly wasn’t visible, but it was there and it was worthy for me to see and understand that with time, things will get better. I never lost hope even though there were dark days. It took so long to get out of bed or to be able to get dressed and the nerve pain that somebody feels when you go through an amputation. Only those people can understand that excruciating pain and there’s all these different factors. For me, it’s consider trying to live on my own again, trying even just daily simple activities, little things that people take for granted – when I accomplish those it was like a victory. Those were the good days. I wish I could explain to people what it is that makes me strong. I always knew that life would get better. If I knew that life would get better, I would become stronger in myself both physically and mentally. Now it’s been six years since the amputations. There are still things that I need to change especially to become fully independent and mobile. I hope that being mobile again will one day become a reality. I know it will. I think the way I share hope is through emails with people. These are people who have contacted me whether they’ve seen a program or have seen my website or somebody’s told them about me. Through the experiences I’ve had, I can put them in touch with my amazing doctors in Cambridge and they can get medical diagnosis and treatment. It’s not that just practical hope that I offer. Sometimes people look at me and they see how happy I am and I’m comfortable in myself and I’m proud to have been born with this unique condition – it surprises them and it gives them hope. These parents of children with overgrowth condition, we offer them hope because they think “I hope my child grows to feel so happy, content and proud as you are to have this condition”. I think that is one of the ways that I’m giving people hope.